Most people aren’t very familiar with Japanese cuisine, despite how much it has to offer. While sushi is delicious and the most popular choice, many people have not heard of the tasty and savory okonomiyaki. Often considered a type of Japanese pancake, okonomiyaki is typically associated with the Kansai and Hiroshima areas of Japan. Both of these areas offer a different take on okonomiyaki. 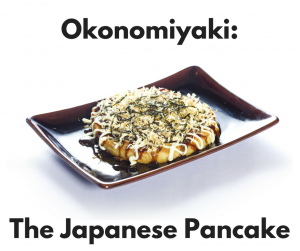 Much like a pancake, okonomiyaki is made from batter. A particular characteristic of the Hiroshima okonomiyaki is the layering of ingredients. Usually, there are layers of batter, pork, cabbage, and then extra toppings like octopus, cheese, or squid. Udon noodles make a delicious topping, as does fried egg. The ordered layering of these ingredients and toppings is usually up to the chef’s style and the customer’s preference. The Kansai style of okonomiyaki features a batter typically consisting of flour and eggs, accompanied by shredded cabbage, grated nagaimo (a variant of yam), and water or dashi (a soup stock). Unlike the Hiroshima style, the ingredients are mixed rather than layered, and there is less cabbage than would be included in the Hiroshima style of the okonomiyaki. Okonomiyaki is thought to have originated in Osaka. Similar to a pancake, all of the ingredients and batter cook evenly on a pan or griddle with flipping in between. Many restaurants which serve okonomiyaki have ‘grill-it-yourself’ options which allow the customers to use a bowl of ingredients and make their own okonomiyaki. There are also diner-style restaurants where chefs prepare it at the counter right in front of the customer. Regardless of what you put in it or how it’s made, okonomiyaki is a wonderful dish that everyone should try. The customizable recipe allows anyone to make the dish to their liking, and it is as easy as making a pancake. To try okonomiyaki yourself, trust no other than Shogun Japanese Steakhouse. We offer authentic Japanese cuisine prepared by our teppanyaki chefs before your eyes on our tableside grills. Make a reservation today by calling us at 407-996-4444.